Nypol 64-28 is manufactured from specially selected bitumen, combined with SBS polymers, and is ideal for surfaces that are subjected to heavy loading, such as runways at airports. It was confirmed a few years ago that the western runway at Oslo Airport was starting to approach the end of its technical useful life. To ensure that flight safety was not compromised, a decision was taken that the entire runway, around 3,000 metres in length, would be re-asphalted in the summer of 2015. This was a wide-ranging project, which was divided into three stages in order to minimise disruption to regular air traffic. All work was also carried out in the evenings and at night. The client, Avinor, which owns 46 airports in Norway, had defined strict requirements for all elements of execution, from cavities to compression. It was also a requirement that the asphalt must withstand temperatures between -28 and +64 degrees without any cracking or deformation. Veidekke won the contract at Oslo Airport. The assignment included both a new base course (asphalt concrete) and a new surface course (mastic asphalt). The total surface area covered 183,000 square metres. The aggregate was selected with great care to fulfill the high demands to stability. The asphalt mix must be resistant to the chemicals used for de-icing aircraft and keeping the runway free from ice during the winter. In order to guarantee a surface that was both stable and flexible, a decision was made to invest in a highly modified asphalt mass (PMB) – 43,000 tonnes in total. Asphalting an airport runway is different in crucial ways from when a road is asphalted. Planning is meticulous in order to manage the logistics and meet the safety requirements. Furthermore, everything that is brought in, e.g. both people and machines, has to pass through a security check. Also, everyone in the paving teams has to have completed a customised safety training programme. Work started with the milling away of the old surface. When the surface course was asphalted, two paving machines drove in parallel so that they could pave a width of 15 metres in constant operation. The base course (Ab 16PMB) was 6 cm thick and the surface course (Ska 11 PMB) was 3.5 cm, producing a total paving thickness of 9.5 cm. 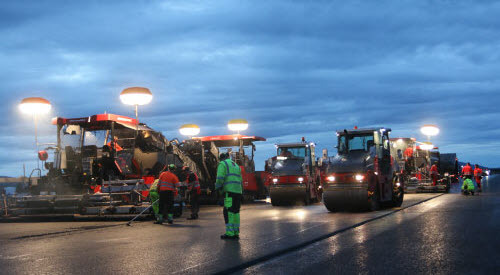 The asphalt was delivered from, among other sources, Veidekke’s asphalt plant in Ullensaker. Nynas supplied the base bitumen, while polymer modification was carried out at Veidekke’s own PMB plant in Moss. 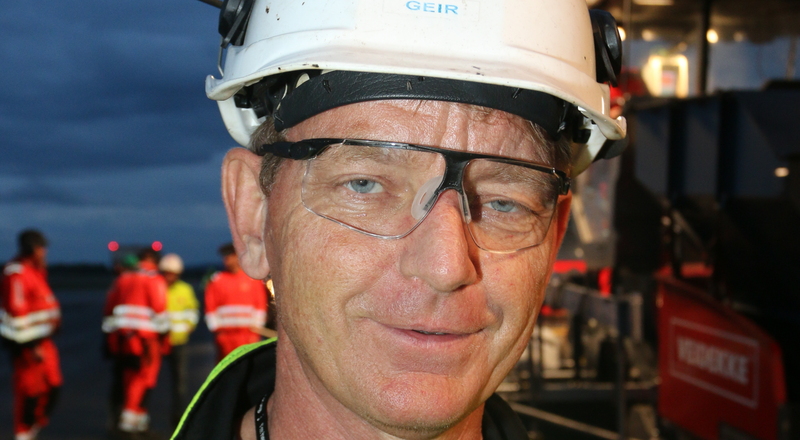 The high tempo and tight margins meant that Nynas was on standby at all times to deliver PMB (Nypol 64-28) from the Gothenburg refinery if Veidekke was temporarily unable to produce enough from its own plant, which is actually what happened in the final phase. Paving work at Oslo Airport is characterised by strict quality requirements and a high tempo. This became very clear in the first stage, which involved 1,350 metres of the runway. In 70 hours, no fewer than 18,500 tonnes of asphalt were laid. To achieve this it took two asphalt plants, 37 trucks and four paving teams working 12-hour shifts. It is unlikely that this much asphalt has ever before been laid in Norway in such a short time. In other words, a Norwegian paving record!